The World Health Organization defines social determinants of health (SDOH) as “the conditions in which people are born, grow, live, work, and age.” Examples of SDOH include economic stability, education, and social support. As the health system moves away from fee-for-service reimbursement and toward value-based care reimbursement, healthcare leaders are recognizing the importance of addressing SDOH in order to meet quality reimbursement standards and improve patient outcomes. In fact, many states now require their Medicaid accountable care organizations (ACOs) and managed care organizations (MCOs) to address SDOH. Last week, I attended the Pharmacy Quality Alliance (PQA) Social Determinants of Health Forum: Exploring Medication Access and Quality. PQA assembled approximately 250 senior healthcare decision-makers to exchange open dialogue around methods for acknowledging and responding to SDOH as a component of quality performance measurement. Attendees and speakers represented multiple data, healthcare, and quality organizations, including: Aetna, Blue Cross Blue Shield Illinois, Humana, IBM Watson Health, LexisNexis Health Care, National Committee for Quality Assurance (NCQA), National Health Council (NHC), National Quality Forum (NQF), and Pharmacy Quality Solutions (PQS). 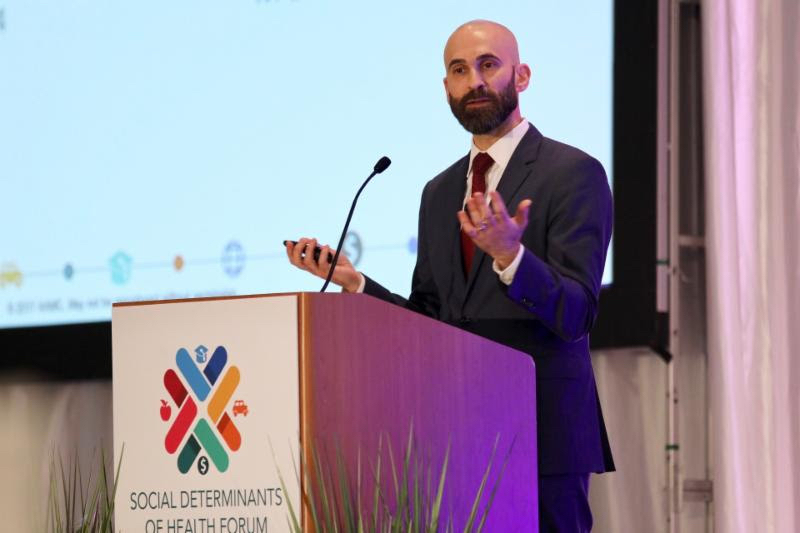 Pictured: Keynote speaker, Philip M. Alberti, PhD; Senior Director, Health Equity Research & Policy Association of American Medical Colleges Photo source: PQA. The forum opened with a keynote session given by Dr. Renaisa Anthony, MD, MPH. “It’s not just biology,” Anthony stated. “There are social things in people’s lives that affect their outcomes.” Only 30% of an individual’s health outcomes can be attributed to genetics; the two other major contributors are behavioral patterns (40%) and social circumstances (15%). Social factors such as food insecurity, isolation, and a lack of transportation will impact a person’s ability to obtain healthcare and can result in elevated healthcare costs and a negative impact on management of chronic conditions. Throughout the remainder of the forum, speakers and panelists identified barriers to and opportunities for incorporating SDOH into quality measurement and payment systems. Barriers included a lack of availability of structured data and a lack of understanding for how to use SDOH data in the clinical setting. Many SDOH screenings are being incorporated into electronic health records, and analytical methods are advancing to screen for and intervene on SDOH factors. However, a more consistent method for capturing SDOH across organizations is needed. Additionally, providers are already suffering from “measurement mania” – rather than adding to their measurement burden, it is important to focus on better stratification within existing quality metrics. For example, understanding patient-level SDOH may contribute to more fair reimbursement practices for providers disproportionately taking care of vulnerable patient populations, but standards for quality indicators should not be lowered for these patient populations based on their socioeconomic characteristics. axialHealthcare is committed to understanding the impact SDOH may have on patient access to care, especially with regard to high quality pain treatment and medication-assisted treatment (MAT) for opioid use disorder. Our continued participation in conversations surrounding SDOH will help shape our consideration for these factors as we work toward innovative solutions for pain and opioid care. Schroeder SA. We can do better – improving the health of the American people. N Engl J Med. 2007;357:1221-8.